I have had a few favourite animated movies like Ice Age, Shrek, Stuart Little to name a few. And now that I get to watch them with Navya gets me even more excited about them. Though her attention span is 5 minutes(at max) but that doesn't stop me from looking for different movies all the time. 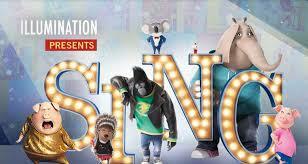 This search led me to a wonderful movie - SING. I watched it just yesterday for the first time and loved it. Navya's take on the movie was again 5 min attention span. But with so many different animals to look at and identify i am sure navya will like it in the long run. The bonus for the movie is the music. We will surely be watching it again this week atleast twice. Do you like watching movies with you little ones? Which is your favourite movie to watch with your kids? IS their any movie in particular you are excited about?